The Allegory of the Cave was presented by the Greek philosopher Plato in his work the Republic (514a–520a) to compare "the effect of education (παιδεία) and the lack of it on our nature". It is written as a dialogue between Plato's brother Glaucon and his mentor Socrates, narrated by the latter. The allegory is presented after the analogy of the sun (508b–509c) and the analogy of the divided line (509d–511e). All three are characterized in relation to dialectic at the end of Books VII and VIII (531d–534e). Plato has Socrates describe a group of people who have lived chained to the wall of a cave all of their lives, facing a blank wall. The people watch shadows projected on the wall from objects passing in front of a fire behind them, and give names to these shadows.The shadows are the prisoners' reality. Socrates then explains how the philosopher is like a prisoner who is freed from the cave and comes to understand that the shadows on the wall are not reality at all, for he can perceive the true form of reality rather than the manufactured reality that is the shadows seen by the prisoners. Socrates remarks that this allegory can be paired with previous writings, namely the analogy of the sun and the analogy of the divided line. Socrates likens our perception of the world around us "to the habitation in prison, the firelight there to the sunlight here, the ascent and the view of the upper world [to] the rising of the soul into the world of the mind" (517b). The allegory of the cave is also called the analogy of the cave, myth of the cave, metaphor of the cave, parable of the cave, and Plato's Cave. 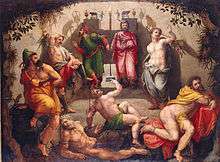 Plato begins by having Socrates ask Glaucon to imagine a cave where people have been imprisoned from childhood. These prisoners are chained so that their legs and necks are fixed, forcing them to gaze at the wall in front of them and not look around at the cave, each other, or themselves (514a–b). Behind the prisoners is a fire, and between the fire and the prisoners is a raised walkway with a low wall, behind which people walk carrying objects or puppets "of men and other living things" (514b). 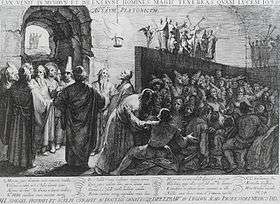 The people walk behind the wall so their bodies do not cast shadows for the prisoners to see, but the objects they carry do ("just as puppet showmen have screens in front of them at which they work their puppets" (514a)). 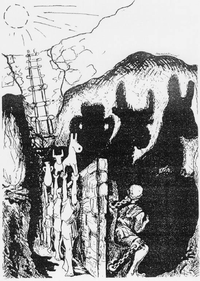 The prisoners cannot see any of what is happening behind them, they are only able to see the shadows cast upon the cave wall in front of them. The sounds of the people talking echo off the shadowed wall, and the prisoners wrongly believe these sounds come from the shadows (514c). Socrates suggests that the shadows are reality for the prisoners because they have never seen anything else; they do not realize that what they see are shadows of objects in front of a fire, much less that these objects are inspired by real living things outside the cave (514b-515a). Allegory of the Cave. Left (From top to bottom): Sun; Natural things; Shadows of natural things; Fire; Artificial objects; Shadows of artificial objects; Allegory level. Plato then supposes that one prisoner is freed. This prisoner would look around and see the fire. The light would hurt his eyes and make it difficult for him to intuit the objects casting the shadows. And if he would be furthermore told that what he is seeing is not real but instead another version of reality, he would not believe it. In his pain, Plato continues, the freed prisoner would turn away and run back to what he is accustomed to (that is, the shadows of the carried objects). He writes "... it would hurt his eyes, and he would escape by turning away to the things which he was able to look at, and these he would believe to be clearer than what was being shown to him." Plato continues: "Suppose... that someone should drag him... by force, up the rough ascent, the steep way up, and never stop until he could drag him out into the light of the sun." The prisoner would be angry and in pain, and this would only worsen when the radiant light of the sun overwhelms his eyes and blinds him. The sunlight is representative of the new reality and knowledge that the freed prisoner is experiencing." Plato continues, saying that the freed prisoner would think that the real world was superior to the world he experienced in the cave; "he would bless himself for the change, and pity [the other prisoners]" and would want to bring his fellow cave dwellers out of the cave and into the sunlight (516c). The returning prisoner, whose eyes have become accustomed to the sunlight, would be blind when he re-enters the cave, just as he was when he was first exposed to the sun (516e). The prisoners, according to Plato, would infer from the returning man's blindness that the journey out of the cave had harmed him and that they should not undertake a similar journey. Socrates concludes that the prisoners, if they were able, would therefore reach out and kill anyone who attempted to drag them out of the cave (517a). The allegory is probably related to Plato's theory of Forms, according to which the "Forms" (or "Ideas"), and not the material world known to us through sensation, possess the highest and most fundamental kind of reality. 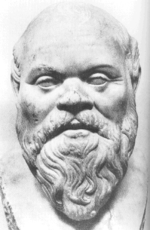 Only knowledge of the Forms constitutes real knowledge or what Socrates considers "the good". Socrates informs Glaucon that the most excellent people must follow the highest of all studies, which is to behold the Good. Those who have ascended to this highest level, however, must not remain there but must return to the cave and dwell with the prisoners, sharing in their labors and honors. Plato's Phaedo contains similar imagery to that of the allegory of the Cave; a philosopher recognizes that before philosophy, his soul was "a veritable prisoner fast bound within his body... and that instead of investigating reality of itself and in itself is compelled to peer through the bars of a prison." Scholars debate the possible interpretations of the allegory of the Cave, either looking at it from an epistemological standpoint – one based on the study of how Plato believes we come to know things – or seeing it through a political lens. While there are scholars whose interpretations fall between these two and others have perspectives completely independent of either, it is the epistemological view and the political view, fathered by Richard Lewis Nettleship and A.S. Ferguson respectively, that tend to be discussed most frequently. Nettleship interprets the allegory of the cave as one about human ignorance and people who are unable or unwilling to seek truth and wisdom. Ferguson, on the other hand, bases his interpretation of the allegory on a description of the way rulers, without a strong philosophical mindset, manipulate the human population. Evolutionary biologist Jeremy Griffith's book A Species In Denial includes the chapter Deciphering Plato’s Cave Allegory. The films The Matrix, Dark City and City of Ember model Plato's Allegory of the Cave. The novel Room by Emma Donoghue and its film adaptation were inspired by Plato's Allegory of the Cave. Ray Bradbury's novel Fahrenheit 451 explores the themes of reality and perception also explored in Plato's Allegory of the Cave and Bradbury even references Plato's work in the novel. José Carlos Somoza's novel the Athenian Murders is presented as a murder mystery but features many references to Plato's philosophy including the allegory of the cave. 1 2 3 4 5 6 7 8 9 10 11 12 13 14 Plato. Rouse, W.H.D., ed. The Republic Book VII. Penguin Group Inc. pp. 365–401. ↑ The various English names of this allegory were often traditionally capitalized as if they were the names of a chapter in Plato's text, which is not correct, or according to an older style that capitalized all (famous) allegories and theories and even concepts. Wikipedia's manual of style does not follow this older practice, and neither do many modern publications in reliable sources nor, for example, the Encyclopaedia Britannica and the Columbia Encyclopedia. ↑ Elliott, R. K. (1967). "Socrates and Plato's Cave". Kant-Studien. 58 (2): 138. 1 2 Hall, Dale (1980). "Interpreting Plato's Cave as an Allegory of the Human Condition". Apeiron: A Journal for Ancient Philosophy and Science. 14 (2): 74–75. Retrieved 10 December 2014. ↑ Nettleship, Richard Lewis (1922). "XII". In Charnwood, G. Lectures on The Republic of Plato. London: MacMillan. pp. 259–293. ↑ Ferguson, A.S. (January 1922). "Plato's Simile of Light. Part II. the Allegory of the Cave (Continued)". The Classical Quarterly. 16 (1). JSTOR 636164. ↑ Griffith, Jeremy (2003). A Species In Denial. Sydney: WTM Publishing & Communications. p. 83. ISBN 1-74129-000-7. ↑ The Matrix and Philosophy: Welcome to the Desert of the Real By William Irwin. Open Court Publishing, 2002/ ISBN 0-8126-9501-1 "written for those fans of the film who are already philosophers." ↑ Keates, Jonathan. "Shadows on the Wall". New York Times. Retrieved 24 November 2002. ↑ "Q & A with Emma Donoghue – Spoiler-friendly Discussion of Room (showing 1–50 of 55)". www.goodreads.com. Retrieved 2016-01-30. ↑ "Parallels between Ray Bradbury's Fahrenheit 451 and Plato's 'Allegory of the Cave'". ↑ Bradbury, Ray (1953). Fahrenheit 451. The Random House Publishing Group. p. 151. ISBN 978-0-758-77616-7. Wikimedia Commons has media related to Allegory of the cave.